If you are hoping to start out on a career as a junior hairdresser, this Level 2 NVQ Diploma in Hairdressing is the ideal course. You will develop a complete repertoire of technical skills to prepare you for employment as a junior hairdresser/stylist in a number of industries. You will learn practical skills as well as how to ensure there are no risks to health and safety in a salon environment. The qualification has been approved by the Hairdressing and Beauty Industry Authority. After this course, you can continue on to the Level 3 Diploma. The Level 2 Diploma consists of a minimum of 54 credits. 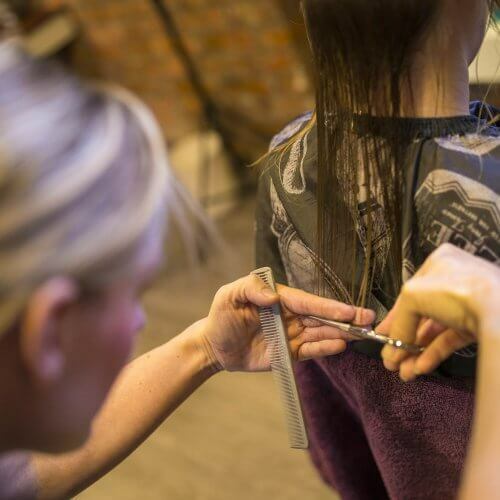 You’ll be assessed for the modules by a mixture of observations and assignments, to show that you have both the practical skills and the theoretical knowledge to work competently as a hairdresser. To prove that you have completed the modules, you’ll be asked to have a portfolio of evidence such as observed work, witness statements, written questions and case studies. If you’re interested in further education, you can look at other level 2 vocational qualifications, or progress onto the NVQ Level 3 Diploma in Hairdressing. You must be qualified to GCSE level in Maths and English. A deposit of £300 is required to secure your place. Refunds are not given unless you give a cancellation notice 7 days before the course is due to start. Call us direct on 0151 548 7730 to find out more about this course. Gutted to be finishing, really enjoyed the course & would have been lost with Nikki, Thank you so much! Learning new skills every week. Michelle made me feel so confident. Everybody was so helpful. Very Happy! The Tutor Michelle her knowledge is outstanding and sunny disposition makes it a pleasure to learn she is extremely motivational which is essential when learning at such a fast pace. Michelle is an outstanding teacher and mentor. Small group has been great, practical experience invaluable! Friendly atmosphere, small class sizes, confidence building, start practical skills straight away, good variety of clients. Michelle is patient, knowledgeable, friendly and puts you at ease. She has made the learning experience experience fun & effective. Helen is helpful and approachable. Material was good and Natalie was really approachable & helpful. I liked everything about this course.